Off to the Museum of Modern Art (MoMA) in NY? See our insider advice for a queue-free visit as well as opening times and phone numbers! Avoid visiting the museum during Easter week, one week before Christmas, the week between Christmas and New Year and right after Thanksgiving. That’s when the crowds are enormous. Think twice if you plan to visit the MoMA during the school holidays: in summer months or during the Spring Break it also gets very crowded. 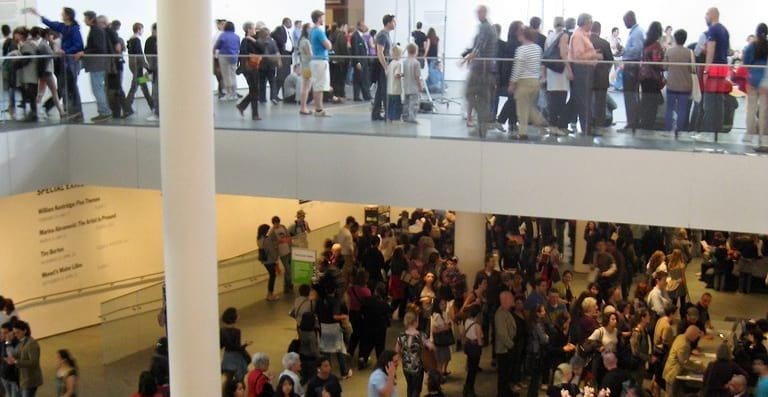 Some current expositions may attract tons of visitors and create long waiting lines. We advise you therefore to check the official website and delay your visit if possible if you find out that there’s a popular exhibition that has started within the last two weeks or coming to an end within the two upcoming weeks: the attendance will be significantly higher! Come on a sunny day, instead of choosing the rainy one for your visit: on the days with rainy weather the number of visitors doubles! As there’s a free entry on Friday afternoons (from 4 pm to 8 pm), that’s when waiting lines are the longest, and the worst decision would be coming in the first half an hour of this time slot. On the other hand, Friday midday (from 12 to 4pm) is the best moment to visit the MoMA without crowds, as most people will wait for 4 pm to save money for tickets. Mornings are the busiest at the museum, prefer coming after 11:30 when it gets quieter. Early and late afternoon is the best time slot, keep in mind however that the museum closes early (5:30pm except Fridays). Sunday mornings are relatively quiet and could also be a great option to discover the museum’s collection. Most visitors start their museum tour from the top: it’s where the main highlights are exhibited: the fifth floor with the Painting and Sculpture Galleries and the fourth floor where they continue with more recent masterpieces. Temporary collections are on the 6th floor and can also be very crowded. If you come for a short visit or don’t have much time - this is what you definitely should see at MoMA. However, beware that these are always the most crowded floors! If you come in the afternoon - you may prefer to explore the museum from the first floors to the top thus getting to the main highlights before the closing time when there will be less people in the rooms. Vincent van Gogh’s “The Starry Night” is the most popular painting in the museum, with big crowds, especially during peak season. Buying your skip the line tickets in advance is of course a good way to avoid queueing once there. All bags are subject to security inspection before entering the Museum. To avoid a long wait in the checkroom line (20 minutes during busy times), leave big bags and rucksacks at home. All galleries and facilities are wheelchair accessible. Wheelchairs are available in the checkroom free of charge. For popular current exhibitions it may be necessary to book a timed-entry ticket online. Check the MoMA website for more information. Photography for personal use is permitted in collection galleries only. No flash, tripods, or camera extension poles allowed. Baby strollers are permitted on all floors, but are not permitted on escalators. Admission is free for all visitors during Free Friday Nights, held every Friday evening from 4:00 to 8:00 p.m. Tickets for Free Friday Nights are not available in advance. The free ticket gives you access to all Museum galleries, exhibitions, and films. From the east side of Manhattan: lines M 1, 2, 3, 4, or 5 to 53rd Street. From the west side of Manhattan: M50 cross-town to 50th Street. Proceed to 53rd Street. Feel free to comment or give your opinion on Museum of Modern Art (MoMA). However, please agree to respect our terms. Please don’t post defamatory, insulting or disparaging comments- as we will have to moderate them. Instead, explain what happened in a factual way.